1200 Pounds! Great Job Cortland!! 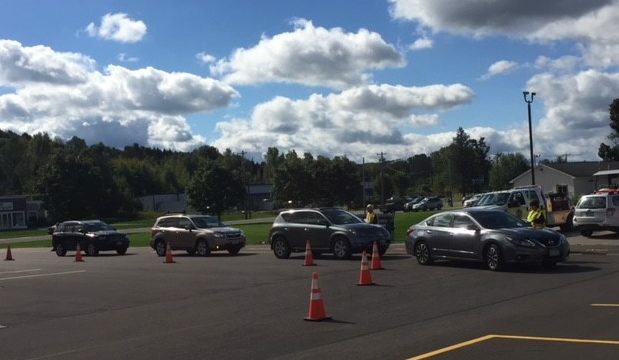 - Family Counseling Services of Cortland County, Inc.
Over 247 vehicles drove through the medication drop off sites throughout Cortland County. On Saturday, community members dropped off 1,200 pounds of expired and unused over-the-counter and prescription medications at a community-wide collection event! Drive-through drop off sites were located in Cortlandville, Cincinnatus, Homer and Marathon. The collection events were first launched in 2010 and to date have collected 19,583 pounds of medication and safely disposed of them. In 2014, we introduced year-round drop boxes which are located at the County Sheriff’s Office, Cortland Police Department, Village of Homer Police Department and the SUNY Cortland Police Department providing secure locations for the medication collection kiosks that are available to the public seven days a week. Although most people take prescription medication responsibly under a doctor’s care, there has been a rise in non-medical use of prescription and over the counter drugs. Most Cortland County youth (ages 12-25) that abuse or misuse prescription drugs get them at home, or from friends and family. Non-medical use of prescription drugs can lead to addiction or even be lethal. Commonly misused prescriptions medications include those that are intended to relieve pain, anxiety, and sleep disorders. Lock your medicine cabinet- Prevent others from using your medications by securing it in a place children and others cannot access. Take inventory-Routinely take inventory of the type and amount of medications you currently have and check regularly to ensure that nothing is missing. Proper disposal- Dispose of medications at a community drop box site or disposal event. The drive-through collection events would not be possible without the many volunteers who help, including local pharmacists and members of the Cortland County Retired and Senior Volunteer Program (RSVP). We are pleased to have officers from the Cortland County Sheriff’s Office assist with each drive-through collection event, transport the medications to the Oswego County Energy Recover Facility, and witness their safe destruction in the incinerator at that facility. Cortland County District Attorney Patrick Perfetti is a strong supporter of the medication collection and disposal program and his office provides financial support to help cover the incineration costs through the Asset Forfeiture Program. These funds are derived through the seizure and forfeiture of assets that represent the proceeds of, or were used to facilitate a crime. The medication collection events and kiosks are an ongoing project of the CACTC Coalition with Cortland Prevention Resources (CPR) serving as lead agency for the project. Cortland Prevention Resources is a division of Family Counseling Services (FCS).